Copyright © 2013 Lucasfilm Ltd. and TM. 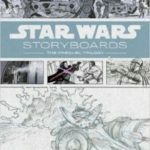 Star Wars Storyboards: The Prequel Trilogy LucasFilm Ltd, introduction by Iain McCaig, edited by J.W. Rinzler (Abrams, £21.99) Copyright © 2013 Lucasfilm Ltd. and TM. 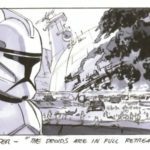 COMMANDER – “THE DROIDS ARE IN FULL RETREAT”:The battle is won—so far. 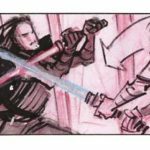 » Damaggio Rodolfo Damaggio (Artist) Episode II Copyright © 2013 Lucasfilm Ltd. and TM. 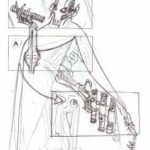 Caption 3 (SW Storyboard 8) Grievous adds Shaak Ti’s lightsaber to his collection. » Thompson Derek Thompson (Artist) Episode III Copyright © 2013 Lucasfilm Ltd. and TM.